The history of the temple dates back to about 1000 years. 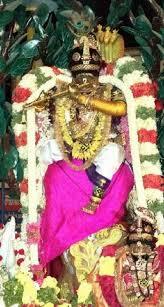 There once lived a staunch devotee of Lord Vishnu, the king Sumathirajan who worshipped the lord day and night. He undertook great penance in order to receive darshan from the lord. Since, this period marked the end of the Mahabharta yuga, It was his deep desire to have darshan of the Lord in the sarathy form. After undertaking huge penance for days together and performing complicated yagna's, the lord gave him darshan. He appeared in the form of Sarathy of Lord Arjun sitting in front of his chariot. He is holding only the couch on one of his hands, and the other is bruised with scars which depicts the shots of the arrows which the lord borne in order to shield Arjuna. King Sumathirajan worshipped the lord and requested him to stay in this very form at the same spot and give darshan to his other devotees. 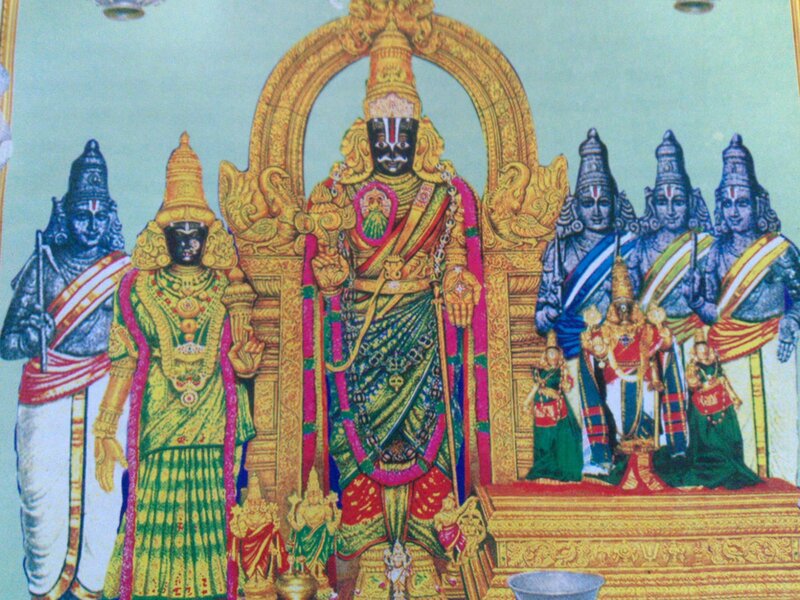 Since, then the TiruvallikeniParthasarathyPerumal Temple has been built and the lord has been worshipped here in his Sarathy form. 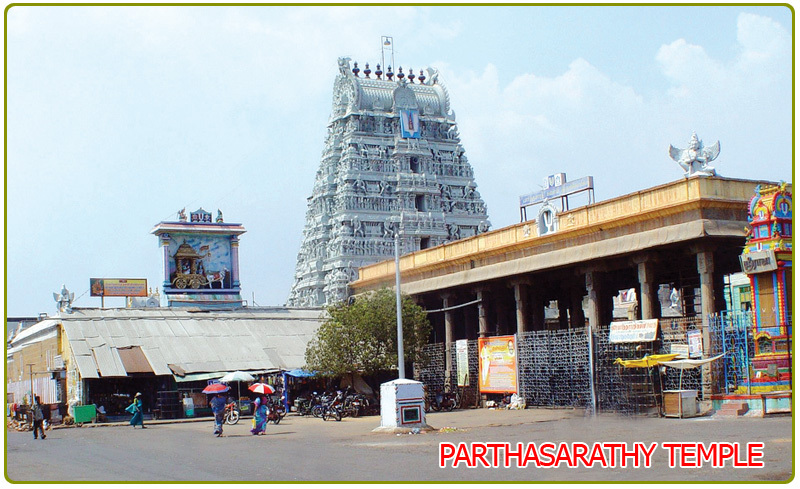 TiruvallikeniParthasarathyPerumal Temple is considered to be a very important temple since it is believed that the lord himself came to the spot for giving darshan to his devotees. People who worship the lord are believed to be relieved of all negative energies from their life. 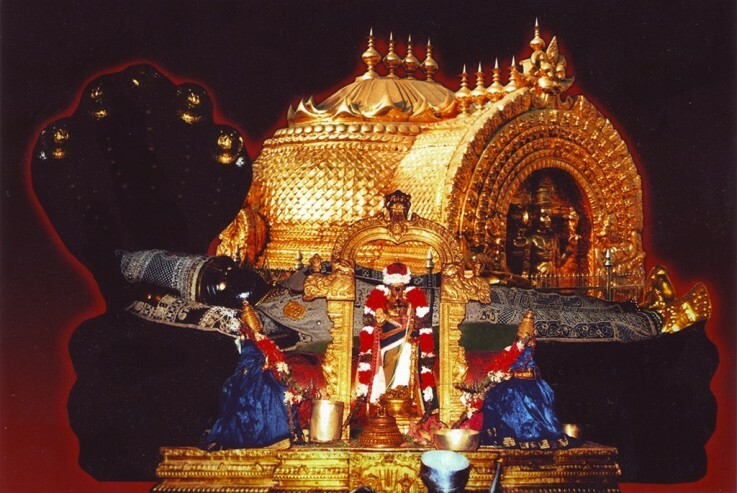 One of the unique facts about the temple is the form of Lord which is present here. This is the only temple amongst the 108 Divyadeshams to have an idol with the moustache form of Sarathy of Arjun depicted by holding the chariot in the battlefield of Kurukshetra. 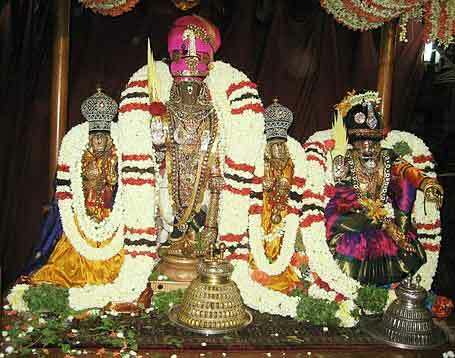 All the more, the lord is present here along with all his family members which is also unique to this temple. Many tourists visit the temple just to have a glance of the form of lord. The architecture of the entire temple is also very artistic with the main deity measuring about 9 feet tall. 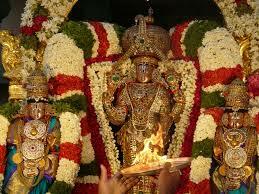 All these make this temple one of its kind among the Vishnu temples. Laksharchana is one of the biggest festivals celebrated in this temple. This is a 10 day festival which is held annually in the month of February. Another festival is Brahmmotsavam which is held in the month of April, is also a grand festival attracts thousands of devotees year round. Some other noteworthy festivals which are observed are Ekadashi, Janmashtmi, Mahashivratri and Navrati. The temple is also considered as an ideal place for organizing marriage functions and mundane ceremony.